The photo right shows the inert excercise version. Identical to the Dutch DM 31 EXC. 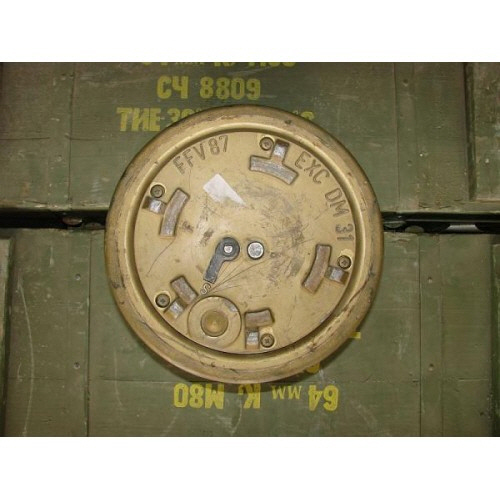 The FFV 028 is a series of steel cased Swedish anti-tank mines that use electronic fuzes. The mines are circular, with a large Misznay Schardin effect warhead in the center of the mine, with the fuzing and sensor electronics located in the dead space above the main charge. The design of the mine dates from the 1970s and uses a magnetic influence sensor to detonate the mine, making it able to attack the full width of armoured vehicles. The mine can be laid either by hand or by a mechanical mine laying system. Once the mine is emplaced, a pre-set arming delay of up to 60 minutes is initiated, after which the magnetic sensor activates and will trigger the mine if a target passes overhead. When the mine is triggered, a small clearing charge blows away any material that may have been on top of the mine, followed a fraction of a second later by detonation of the main explosive charge detonates. The main charge creates an explosively formed penetrator which is capable of penetrating the belly armour of any tank currently in existence, and generates substantial secondary blast and fragmentation effects. The mine is blast resistant and has been upgraded to be resistant to advanced demining mine countermeasures. The mine was ordered by the Swedish armed forces in 1982, where it is known as Stridsvagnsmina 6. 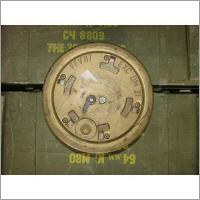 Subsequently, an order from Germany was placed for 125,000 mines in 1985. The Netherlands placed an order for in excess of 10,000 mines and associated mine laying equipment in 1985, with a second order for additional mines in 1989. FFV 028 SN - Self-neutralizing version of the mine, which disarms itself after 30 to 180 days, indicating its status by launching a red marking cylinder attached to a 0.5 meter long wire. DM 31 - German version of the mine.